Firmness: the expectations you have for your child’s behavior and the way you make rules. Scientists have defined “authoritative parenting” as a style of parenting that strikes a healthy balance between warmth and firmness. Authoritative parents show affection and love towards their child, but they’re not afraid to set standards for their child’s behavior and follow through, every time, when those standards are not met. Authoritative parents explain why rules are important. Even when they disagree with their child’s point of view, they are still willing to listen, discuss, and sometimes compromise! They are firm but gentle. Children of authoritative parents follow their rules because they want to please their parents, not because they are scared of them. They eventually buy into the rules and figure out how to follow them in new situations without being told. Of course, no parent is perfect. 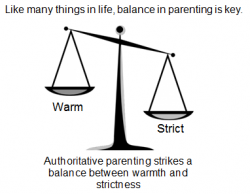 But striving for balance between warmth and firmness can help guide you towards better parenting choices.